I can’t think of a better way to celebrate the holiday season than to take a beautiful Christmas song and use it as the motivation to write a whimsical, slightly lame article with a yuletide theme. But because I lack originality and yet also want to bring Christmas cheer, I present the 12 Flames of Christmas… a holiday wish-list for 12 members of your favourite team. A return to form. No one is going to question how difficult this season has been for Elliott, but that doesn’t mean it has to continue that way. Elliott led the NHL with a 0.930 save percentage and an 0.862 high danger save percentage last season, so what we’ve seen so far this season is absolutely a surprise. The good news is we know what Elliott is capable of, though. He was brilliant for St. Louis in the playoffs last year and has been one of the NHL’s most consistent goalies over the last five years. Chad Johnson has been a great story, but the Flames are going to need both goalies playing at a passable level if they’re going to get where they want to go. An NHL average shooting percentage. Seeing the captain with just three goals prior to Friday was slightly disarming, especially considering the 21 he posted last season (he has five goals now). But fear not, this is not Giordano tumbling off an offensive cliff. Instead, we’re just talking about some bad luck. At 4.3% through his first 35 games, Giordano has one of the worst shooting percentages on the team and that’s bound to improve as we move into the new year. Just look at what he’s done when pucks have gone in at the league average rate. Giordano’s career shooting percentage is 7.4%, so prior to Friday he was down more than three percent. He’s up to 6.8% after the Canucks game, and things are bound to progress a little more to his career average as the season goes along, so Giordano’s wish is a rather realistic one. More ice time. Despite some rather unwarranted criticism this season, Hamilton has been one of Calgary’s best players. Hamilton leads all Flames defencemen in points this season and, as of Friday afternoon, was tied for third on the team in scoring. (Tied for second, now.) But it goes beyond on that. Hamilton’s work analytically is among the best on the team, regardless of position. His 54.0% possession rate ranks second on the team and number one among blueliners and, with a 46.1% offensive zone start ratio, he’s not being sheltered either. So, you’d think that might put him right near the top in terms of average ice time, but in reality, that hasn’t been the case. 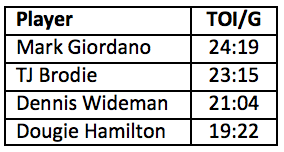 While no one is going to quibble with Giordano and Brodie seeing more ice time, seeing Hamilton almost two full minutes per game behind Wideman is strange. Now, obviously special teams skews this a little and, especially of late, even strength ice time has been fairly evenly distributed over the top four. That said, Hamilton is certainly deserving of even more ice time as the season goes along. A suit of armour. Versteeg has been such a nice addition to Calgary’s lineup this season and the best part is they got him virtually for free. Versteeg’s scoring metrics have been great, as you can see below. The problem is, Versteeg can’t stay healthy! First he missed nine games in November with a groin injury. Upon returning to the lineup, he was clobbered by teammate Troy Brouwer and missed another game. Oh, and then he missed two games in December. Even worse, it seems like something dangerous happens to him every single night. So, for Christmas, if Santa could bring Versteeg some armour like above, many Flames fans would be happy. A proper defence partner. I know the Flames don’t really have a number four defenceman right now, but it sure has been rough watching Brodie play at times this season. While the +/- stat is very rarely a telling one, when you’re sitting at the very bottom of the league by that metric, it’s not a good thing. But how much of this is who Brodie is playing with? Dennis Wideman has been Brodie’s partner for the majority of this season and they just don’t seem like a great fit right now. I don’t think Wideman is necessarily fault, and I know Calgary is in a tough spot with Giordano and Hamilton forming a great pairing leaving them with a lack of options on the second pairing. But this is a Christmas wish list and if the Flames can get Brodie back to the form we’re used to, it would be huge for 2017. A partner that fits with him better could very well be a start. More of the same. Tkachuk has been nothing but outstanding this season, and if he can keep on progressing as an impact player, I don’t think anyone is going to complain. Plain and simple, Tkachuk has been one of the team’s most effective players and is on one of the league’s most effective lines with Mikael Backlund and Michael Frolik. Regardless of his age or experience level, how can you not be happy with what Tkachuk has done this year? Heck, even if he stays at this level for the rest of his career, that’s a pretty solid player to get at sixth overall. The scary part is he’s only going to get better. Bionic hands. Our second Star Wars image of the day relates to Gaudreau, because we don’t want to see him miss any more time this season. Ever since his return from a broken finger that saw him miss 10 games, Gaudreau has been targeted at different times with slashes to his hands and wrists to try and slow him down. The unfortunate part is this probably isn’t going to stop. I’m all for the league being more vigilant in enforcing these things. In fact, I think it’s something the NHL needs to take a good, hard look at in the very near future. 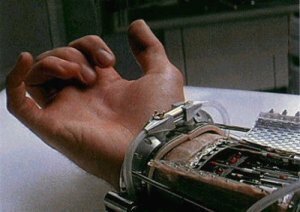 However, as I’m not anticipating that for the rest of this season, I’ll wish for bionic hands instead. A chance. After finally getting an NHL game under his belt this season right before Christmas, all we can hope is for Wotherspoon to continue getting a shot as the rest of the season continues. I truly believe the 2011 second round pick is ready to play a regular NHL shift right now, but I also understand the Flames have a numbers issue on the blueline. That said, to see Wotherspoon work his way in on the third pairing here and there (or Brett Kulak, for that matter) would be nice to see. For both Wotherspoon and Kulak, next season could be huge. Both Dennis Wideman and Deryk Engelland are on expiring contracts and should leave room for both players to jump up and, hopefully, seize regular spots. Trade value. Speaking of Mr. Engelland, I think there’s a real opportunity for Calgary to turn him into something prior to the trade deadline. As we mentioned, Engelland is on an expiring contract and, with a fairly manageable cap hit, could be attractive to a team looking for depth heading into the playoffs. Engelland possesses some of the traits teams seem to covet heading into the playoffs. He averages 3:21 of shorthanded ice time per game, second on the team, and also sits second on the team in blocked shots. I actually don’t mind what Engelland has brought this team on the third pairing this year, but trading him at the deadline presents an interesting opportunity to get a nice asset. A chance on the powerplay. We all know how good Frolik has been this year on the team’s best line with Tkachuk and Backlund. One curious thing this year, though, is his lack of powerplay time. It was especially curious during November when Calgary’s man advantage was horrid and Frolik was the team’s leading scorer. Even now, with the team’s powerplay looking much, much better, it is strange seeing Frolik below the players below in PP ice time. While things are going well on the powerplay, there’s really not a ton of urgency to make personnel changes. That said, if and when things cool down a little bit, I’d be interested to see Frolik get a meaningful chance on the powerplay, because I think he’s certainly earned it. An affordable contract extension. Earlier this month, I made the case here for Ferland to be one of Calgary’s seven protected forwards for June’s expansion draft. Further to that, I think getting Ferland locked up to an affordable extension in the next few months makes a lot of sense. Ferland has been one of the team’s most effective forwards this season and, even more encouraging, I still think there’s a ceiling there. Ferland has been a late bloomer throughout his hockey career and that seems to be very much the same at the NHL level, too. I can’t see him getting a crazy bump, so an affordable extension could very well be in Santa’s bag. Nothing at all. Everyone loves him on this website, he’s been one of the team’s most impressive and important players this year. What more can you get the guy at this point? Wishing everyone a Merry Christmas and a Happy Holiday. My New Year wish is a trade that sees Wideman moved for a RW that is an upgrade on our current options. Figured I would echo this as well (the first part). 2016 was the best year in FlamesNation history and we couldn’t do it without you guys. The site has grown, the community has become closer, and we’ve got so much in store for you in 2017. Merry Christmas, Happy Holidays, and a joyous Kwanzaa. Let’s not forget a happy Hanuka for all our Jewish friends as well. Merry Christmas Mike and crew! You guys are doing a bang up job here. And Mike, extra love to you and the old man. Glad to hear things are on the up. Peace and love to all you filthy animals! 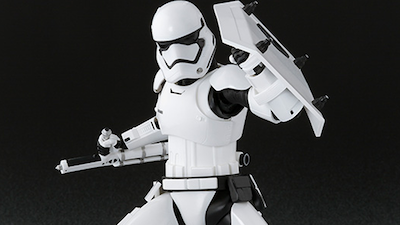 Pat – if you put Kris Versteeg in Stormtrooper armor he will never hit the net again. Please change this. Also – does the opinion on moving Engelland at the deadline change if the Flames are sitting in a playoff spot? Merry Christmas bud, and to FN at large! I mean, Backlund could wish for better shooting talent for Christmas. If he had any finish he’d be an elite all-around center whose name is mentioned in the same breath as Patrice Bergeron and Anze Kopitar. Great write up Pat! Merry Christmas Flames Nation! Before the Flames played the Blue Jackets in Columbus, I felt that they would be a playoff team if the could beat the jackets on the road. Last night, I believed if they lost to Vancouver at home they would not be a worthy playoff team…..fortunately that was not the case. I think it is going to come down to how many points we take from the Oilers. I believe. Pat, I think you can interchange Dennis Wideman for Engellend on the 9th day of Christmas! A affordable extension for Ferland would be a nice present for management, but I can’t see Michael thinking that way. I speculate him refusing a 3 to 4 year extension at 1 to 1.5 per year for a shorter contract.